Sunday, January 7, only five Flint River Bass Club members braved the icy cold to fish our January tournament at Jackson. When we took off at 8:00 AM it was a brisk 24 degrees, the wind was blowing and the water temperature was 45 degrees. At the 3:30 PM weigh-in we had 12 keepers weighing about 23 pounds. There was one limit and one zero. I was surprised there were five largemouth, usually spots are about all that hit in water that cold. I got lucky and made a good decision or two and landed five weighing 10.97 pounds for first and had a 3.64-pound spot for big fish. Jordan McDonald had three at 5.91 pounds for second, Niles Murray was third with three at 5.18 for third and Doug Acree placed fourth with one at 1.38. Knowing how cold it was going to be, I decided to set up a “milk run” of rocky points near the ramp. I did not want to ride far in the cold and wind, and rocky points are a good place to fish this time of year. So at blast-off I idled to a point near the ramp and started casting. On my second cast a keeper spot hit my crankbait and I was thrilled. I knew I would not zero! Then a few minutes later I caught a largemouth on the same crankbait. It weighed almost three pounds so I was really happy. At 8:15 I landed another keeper spot on a jerk bait. That was a really good start, but it got tough after that. I idled to another point and tried to fish it but the wind was blowing on it and my hands started burning. I missed a bite on a jig head worm. I thought I felt a bite but ice in my rod guides made the line scrape as I reeled it in, and I was not sure. I dipped my rod into the water to melt the ice and before I could get back in position the fish took off and spit the hook. That was disappointing. A few minutes later I landed a largemouth that was just shorter than the 12-inch line on my keeper board. After trying to fish some brush on a point in the wind I gave up and went back into a small creek that was somewhat protected from the wind. I would cast out a crankbait, reel it a few feet then have to dip my rod into the water to melt the ice. I just kept working around the creek, casting and dipping, out of the wind. At 11:00 I got my next bite, the big spot. It hit the crankbait on a shallow rocky point. Four in the livewell with two decent fish. I started hoping I might catch a limit. At noon I cast a jig and pig to some brush near a dock, got a bite and missed the fish. Knowing sometimes you can get another bite on different bait I picked up my jig head worm and caught another keeper largemouth, filling my limit. For the next three hours I cast my crankbait and other baits. It was finally warm enough that ice did not form in my guides. At 2:00 I caught a keeper spot on the crankbait that was slightly bigger than the one in the livewell so I culled. At 3:00 I went back to the point where the big one hit. With ten minutes to weigh-in Niles and Zero rode by headed to the ramp. Then, as Jordan came by, I caught my last fish with five minutes left. It was a keeper spot that hit my crankbait and culled my smallest fish. I never got my boat faster than idle speed all day. And it worked! This entry was posted in Bass Fishing, Tournament Fishing on February 24, 2018 by ronniegarrison. Bass do bite in cold water this time of year, if you are at the right place at the right time, and have a bit of good luck. Two trips last week reinforced this idea to me. Last Sunday the Flint River Bass Club fished our January tournament at Jackson and I went to Lanier on Wednesday to get information for my February Georgia Outdoor News Map of the Month article. The trip to Lanier accomplished two goals. I got my information for the article, but also got Jim “LJ” Harmon to work on the electronics in my boat. LJ is a Humminbird Electronics guru, using them to find deep bass at Lanier, but he also wires and sets up new units, and goes out on the water with folks to fine tune their units. Last November LJ went out with me for an hour or so and had my units reading better than I had been able to do in a year of messing with the controls. This problem was with power. The two units on the front of my boat pull a lot of power. They were hooked up through the wiring harness for the boat and went dead sometimes when I cranked the motor. Even worse, they picked up interference when the trolling motor was on, making it hard to read them. LJ ran new wires for them directly to the battery. He fussed at me, saying “you have more crap in this boat than a Jiffy John!” But he got it done, even in the messy weather. While LJ worked on my boat I went out with Jim Farmer to fish. Jim hand paints crankbaits and is an expert on catching Lanier spots on them. The weather was messy but much warmer than it had been. And the places we fished are for February, so it is still early for them, but we caught some nice fish. This entry was posted in Bass Fishing on February 22, 2018 by ronniegarrison. Right on time, sandhill cranes showed up a few weeks ago, headed back north on their annual migration. This is a sure sign spring is not far away. Even more significant, daffodils in my yard started blooming last week, offering a small splash of bright yellow against all the browns and grays of lingering winter. Thursday morning there was a strange bright light in the sky for a few minutes at my house, something not seen in days. Rainy, cloudy days seem the norm in February this year and many more are in the weather guessers forecast. Sometimes, although uncomfortable, it makes fishing and catching better. Water in lakes is warming slowly. Sun on the water warms it faster so it has been slow. 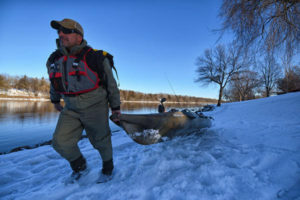 Longer days have made bass and other fish start moving more shallow, thinking about spawning. But cold nights are keeping them from getting in a hurry. I went to Lanier a week ago last Thursday and fished one day in wind and bright sun and two days in the rain. It was interesting, and I spent a lot of time looking for bait and bass but was not successful. I was hoping to find a school of bass or a pattern that would help me in the Flint River Bass Club tournament last Sunday but did not. In our February tournament six of us braved a rainy day to cast for eight hours. We landed only seven keepers longer than the required 14 inches on Lanier, and they weighed about 15 pounds. There were no limits and two fishermen didn’t have a keeper. Jack “Zero” Ridgeway didn’t live up to his name, winning with three fish weighing 5.40 pounds. My one largemouth, the only one caught, weighing 4.85 pounds was good for second and big fish. Niles Murray was third with two at 3.24 pounds and Alex Gober placed fourth with one weighing 1.48 pounds. Sometimes little things come together to make a difference. After fishing Friday without a bite I had dinner with Jim Farmer and his wife. He asked if I had tried the very back of coves where muddy water was running in from all the rain. A few years ago I did an article with Ryan Coleman on Lanier after a lot of rain. He took me to the back of a creek where muddy water was running in and we caught some nice fish on spinnerbaits. I really did not think much of those two things since I was expecting to catch big spotted bass on main lake rocky points. Saturday, I again fished and looked at places where I expected spots to be feeding, and think I had one bite. That was a calm day with no wind, and wind usually helps make spots feed. When Sunday morning had wind, I was ready to fish a spinnerbait all day on rocky points. I started on a rocky point where I won two club tournaments last November but never got a bite in 90 minutes of casting. While fishing another point nearby I kept hearing a noise like running water and spotted a small waterfall in a ditch. All the rain made water flow down the steep rocky bank and gurgle muddily into the lake, staining the whole ditch. All the memories came back so I went to it and cast my spinnerbait all around it. When I cast right to the base of the small waterfall in about a foot of water a fish thumped my bait hard and I set the hook. I thought I had hooked a keeper bass about 20 feet from the boat, but when I set the hook it almost pulled me out of the boat. The fish fought hard, especially with the short amount of line out, and I just knew I would lose it, especially after seeing how big it was. But I was able to net the fish and stop shaking after about ten minutes. For the next three hours I rode around looking for more places where water was running into the lake and fished every one I found, but never got another bite. I had gone back to the place I caught the fish after about an hour to try it again, but the water flow had slowed to a trickle. For the last three hours of the tournament I again tried deep, rocky points and banks and got one bite but did not hook it. I think it was a crappie or bream based on the way it hit, and I was fishing a jig and pig with the tips of the trailer tail dipped in chartreuse JJs Magic. Every fish in the lake will hit at the wiggling tails of a trailer like that. The Potato Creek Bassmasters fished our tournament yesterday at West Point. I’m sure I spent hours fishing backs of pockets with muddy water. As I write this I wonder if they will be there! This entry was posted in Fishing Tackle on February 20, 2018 by ronniegarrison. If you have ever been grouper fishing, I know this has happened to you: You feel the thump of a bite, reel down and next thing you know the fish has “rocked you up” and before you can react, your line goes slack. Fish – and tackle – gone. More times than not the tackle failure takes place at the connections, such as the knot connecting the leader to swivel. Like me, I am sure you have also lost a gator trout, a big snook, or a tarpon because of knot failure. Or maybe the knot was OK, but it was chopped off by a misguided kingfish or Spanish mackerel. Here’s my point: Our tackle is only as strong as its connections. Healthy marine fisheries depend upon strong linkages in the food web too. Take for example the lowly pinfish. 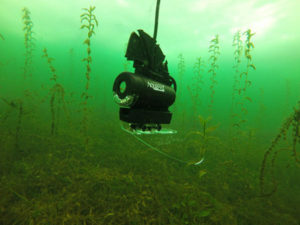 They need healthy seagrass flats to provide them with food and cover. This important species of forage fish give back to seagrasses by cleaning and pruning the plants, which helps keep the meadow growing and healthy. (Small pinfish eat shrimp, as any angler knows, but at about 4 inches and larger they mostly convert to being herbivores.) They are also an essential food resource for a variety of predators that depend upon the pinfish’s ability to turn phytoplankton, algae and seagrass blades into high-octane fatty acids. Ecologists have a handle on the basic linkages of such “trophic” connections, and I bet most anglers have an intuitive understanding of this too. But even though we grasp the importance of forage fish like pinfish, there is not a thorough enough understanding of how or why their populations change over time. Drawing back the curtain on the life history dynamics of forage fish is key to help us prevent the types of trophic “break-offs” that could have devastating impacts on our fisheries. The good news is we’re on our way to gathering this kind of information. Last year the Florida Forage Fish Research Program (FFFRP) – a collaboration between the Florida Forage Fish Coalition, Florida Fish & Wildlife Research Institute (FWRI), and academic institutions –funded two student-led research fellowships and is currently raising funds for additional fellowships in 2018 and beyond. This work will shed some interesting and important light on forage fish populations and their impacts on predators, with the added benefit of supporting the next generation of fisheries scientists. Terry Tomalin, the late Tampa Times outdoors editor, once suggested to a friend that “Gut Content Analysis” would make a great name for a punk band. FWRI’s Fish Biology “Gut Lab” rocks at identifying partially digested forage items found in the stomachs of the predator species we target. For example, a 2006 study conducted by the Florida Wildlife Research Institute (FWRI) showed that forage fish account for 40% of a snook’s diet in the Charlotte Harbor Estuary, and pinfish make up half of that (20% overall). I know gator seatrout love ’em – it was a pinfish that landed my biggest to date (see above right). But when it comes to where these critically important pinfish spawn and spend their lives, we have a lot to learn. We’re left to wonder whether pinfish offshore spawning that supplies the Eastern Gulf’s estuaries occurs in a few critical locations or whether spawning activities are spread out. We also don’t know whether pinfish from all of the Gulf estuaries move offshore to spawn at once, or whether they take turns. Fortunately, scientists from the University of South Florida (USF) plan to change that. USF researchers awarded the first of two FFFRP fellowships in 2017 will use a new technique to discover the secret lives of pinfish. Such insight is gained not by following these fish around and watching what they eat, but rather by examining chemical markers stored in the fish’s tissues. By analyzing carbon and nitrogen isotopes stored in the core of pinfish eye lenses, USF scientists will gain insights about where they were spawned and spent the planktonic phase of their lives before settling into our coastal estuaries. We all know that habitat loss and fragmentation can reduce recruitment of juveniles into gamefish populations. But couldn’t limitations on prey availability also reduce recruitment of wildly popular species such as redfish? For many years, FWRI collected data on forage abundance in Gulf estuaries. Now, the FFFRP fellowship program is funding a University of Florida researcher to evaluate trends for what they think are the ten most important forage sources for redfish and gag grouper. They will specifically try to identify any significant population changes in these key forage species, and determine what effect, if any, these fluctuations might have had on redfish and gag grouper populations. After all, we can’t adequately protect healthy populations of iconic species such as redfish and gag grouper, unless we understand such basic predator-prey relationships. These promising fellowships will publish their results this year. In the meantime, the Florida Forage Fish Coalition is hopeful that the FFFRP can secure funding for many more fellowship projects in the future. This work will provide valuable scientific insight to the FWC as they work to maintain healthy forage, predator populations, and fisheries as outlined in the Florida Forage Fish Resolution passed in June 2015. Visit www.floridaforagefish.org to take the Florida Forage Fish Coalition pledge. 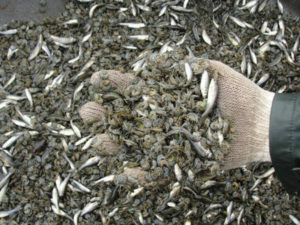 You can donate to the Florida Forage Fish Research Program at https://www.igfa.org/fffrp. 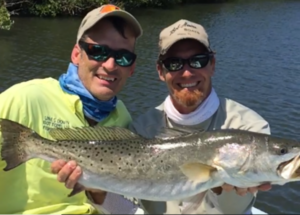 Editor’s Note: The Florida Forage Fish Coalition is a small yet diverse coalition of organizations who understand the critical importance of the baitfish that swim in Florida waters. Some coalition members contributed to information in this story. Please do take the time to visit the web page and take the pledge! Image credits: Pinfsih in Hand image courtesy of Live Advantage Bait. This entry was posted in Fishing Tackle on February 19, 2018 by ronniegarrison. My first bass boat was a 1974 17-foot Arrowglass with a 70 horsepower two stroke Evinrude motor, foot controlled 12 volt trolling motor with about 40 pounds of thrust and a Lowrance flasher depthfinder on the console. It would run about 35 miles per hour top speed. It had an Anchormate on both ends, a winch that raised and lowered a ten-pound mushroom shaped anchor. There was on car battery that cranked the boat and ran everything on it. The trailer was a single axle one with 12-inch tires. I carried a paper lake map with me that showed the basic outline of the lake. I did order a contour map of Clarks Hill, a 52-page book with pages two feet square, that showed depth contours in five-foot intervals. I put sections of it on the wall in my lake trailer. The Arrowglass had a live well of sorts, that would fill about four inches deep with water to keep fish alive, but it did not work very well. The boat was top of the line at the time, and cost just under half my annual teacher’s salary when bought new. When I joined the Sportsman Club that April I had the second biggest motor in the club, there was one 100 horsepower, and the second longest boat. Most boats were 14-foot Sing Fishers with 40 horsepower motors and stick steering. Now I have a top of the line 2016 20-foot Skeeter with a 250 horsepower four stroke motor that will fly down the lake at over 75 miles per hour if I get in a hurry. The trolling motor is a foot controlled 36-volt 112 pound thrust one that will zip the boat along on high and hold it in any wind as long as the waves are not so high they lift the front of the boat get the motor out of the water. It requires four big deep cycle batteries to run everything. There are two live wells that hold about 20 gallons of water. Pumps pull water from the lake to fill them and constantly put in fresh water. Other pumps recirculate the water, keeping it oxygenated, and with the pull of a valve will pump the water out of them to drain then faster than just opening the plug, which can be done remotely. On the back are two Power Pole shallow water anchors. With a push of a button I can extend or retract poles that go down eight feet deep to hold the boat in one place. There are two Humminbird Helix 10 depthfinders on the front and two more on the console, each with 10-inch screens. The trailer is a dual axle with 14-inch tires. It cost almost 20 times as much as my first boat, even though I bought it used. Although my salary had gone up a bit before I retired, the used boat cost almost a full year’s pay. The change in deptfinders is unreal. My old Lowrance had a light that spun around a dial marked in depth numbers and flashed when its sonar pulse hit something. Thats why they were called “flashers.” The bottom showed as a constant bright line and anything above the bottom, like a fish or brush, flashed at its depth. My Helix 10s are like TV screens. Just the electronics on my new boat sell for more than three times the total cost of my first boat. They are networked together and can be divided into windows and all four will show everything that shows up on any of them. A GPS map shows bottom contours of the lake with great detail and I can highlight a depth. If I want to fish from 5 to 10 feet deep I can highlight it in red and keep my boat just outside it to fish that depth consistently. I can also see shallow spots to avoid as I run down the lake and put in waypoints to exactly mark a brush pile or anything else I want to go back to. The depthfinder part is an LCD that shows a moving picture of whatever is below the boat, in color. It will show in detail brush, stumps and fish. The down and side scan paint a picture that looks like a photo, with brush, stumps and rocks looking just like they would look if you were able to see them. Fish show up as small white dots. Even more amazing on the front is a 360 Scan transducer. The image it produces looks like a radar screen with a line going around a circle picture. It scans all around the boat, showing rocks, brush and fish ahead, to the sides and even behind the boat. I have mine set on 60 feet, so I see everything within that distance of the boat. My first boat was a tri hull that was stable while fishing but pounded through waves and jarred you if the water was rough. My new boat is stable while fishing but will cut through two to three-foot waves with little bouncing. It is three feet longer and much heavier, which helps a lot. Do I need all the stuff I now have? No. Do I like having it? Yes. Do all the advancements help me catch more fish? Maybe. After all the difference between men and boys is the price of their toys. This entry was posted in Bass Fishing, boats and boating, Fishing Tackle on February 17, 2018 by ronniegarrison. This entry was posted in Conservation, Saltwater Fishing on February 14, 2018 by ronniegarrison.